The easiest way to download Twitter data. ... her tweets and likes (up to 3,200 and 15,000). ... her followers and following (up to 50,000 each). ... members info of any of her lists (up to 50,000). ... retweet(er)s of her tweets (up to 3,200). ... the most recent replies she received (up to 18,000). Please contact us and ask for more features. You can do all sorts of stuff using Excel! check out the most popular tweets of the U.S. President! Simple: To get the tweets of @POTUS go to twitter.com/POTUS and click on the extension icon. Just wait a few seconds and the Excel file you should automatically download. Done! 1. Configure the download options. Right click the Twlets icon to get to the options menu. *: See the task-URL Mappings table on the right. 3. Get data of your interest with a single click, yay! Regarding download times, although small requests are downloaded within few seconds, beware that downloading 20K followers takes about 3½ minutes and 50K followers takes as long as ~9 minutes. 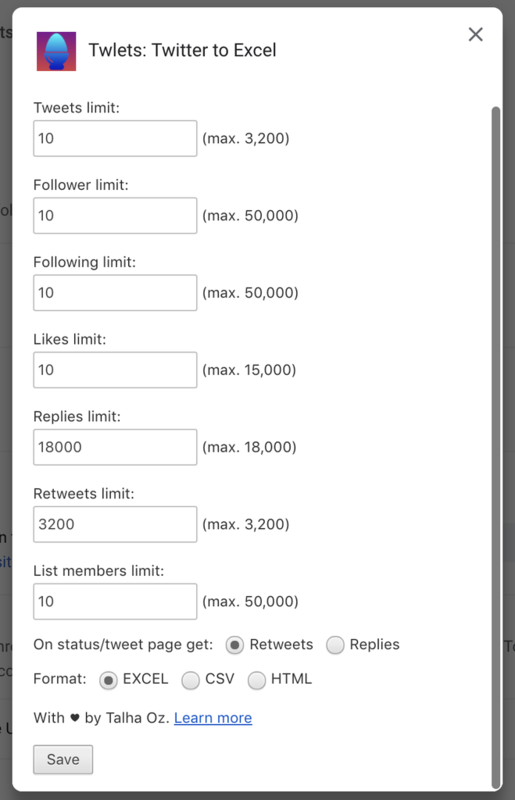 Twlets works within a single Twitter rate-limited window. So, you might get a rate-limit exceeded error if you try too many downloads in a single window, in such cases wait for 15 minutes and then rerun your request. Either pay for what you use, or go unlimited! So, for example, downloading info of 976 followers is 976 credits. When you sign up for the first time you get 1,000 credits for free! 25,000 credits $5.55 USD 1-day unlimited $5.55 USD 1-week unlimited $15.95 USD 1-month unlimited $29.95 USD 3-months unlimited $45.95 USD 1-year unlimited $95.95 USD Please login to buy credits.